The Pixelator example shows how delegates can be used to customize the way that items are rendered in standard item views. By default, QTreeView, QTableView, and QListView use a standard item delegate to display and edit a set of common data types that are sufficient for many applications. However, an application may need to represent items of data in a particular way, or provide support for rendering more specialized data types, and this often requires the use of a custom delegate. A model which represents each pixel in an image as an item of data, where each item contains a value for the brightness of the corresponding pixel. A custom delegate that uses the information supplied by the model to represent each pixel as a black circle on a white background, where the radius of the circle corresponds to the darkness of the pixel. This example may be useful for developers who want to implement their own table models or custom delegates. The process of creating custom delegates for editing item data is covered in the Spin Box Delegate example. Since we only require a simple, read-only table model, we only need to implement functions to indicate the dimensions of the image and supply data to other components. The QAbstractItemModel::reset() call tells the view(s) that the model has changed. Since the image is a simple two-dimensional structure, the parent arguments to these functions are unused. They both simply return the relevant size from the underlying image object. In this implementation, we only check that the model index is valid, and that the role requested is the DisplayRole. If so, the function returns the grayscale value of the relevant pixel in the image; otherwise, a null model index is returned. 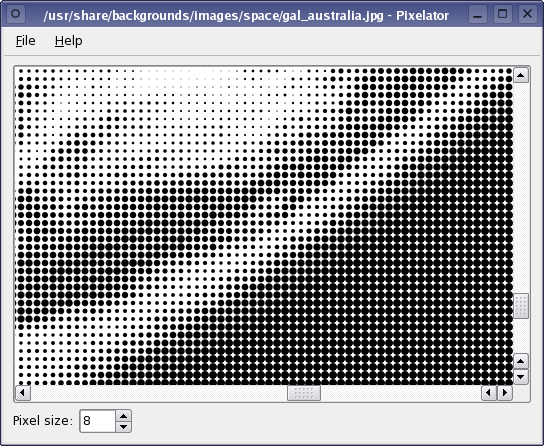 This model can be used with QTableView to display the integer brightness values for the pixels in the image. However, we will implement a custom delegate to display this information in a more artistic way. We return (1, 1) as the size hint for a header item. If we didn't, the headers would default to a larger size, preventing us from displaying really small items (which can be specified using the Pixel size combobox). This class provides only basic features for a delegate so, unlike the Spin Box Delegate example, we subclass QAbstractItemDelegate instead of QItemDelegate. We only need to reimplement paint() and sizeHint() in this class. However, we also provide a delegate-specific setPixelSize() function so that we can change the delegate's behavior via the signals and slots mechanism. The first task the delegate has to perform is to draw the item's background correctly. Usually, selected items appear differently to non-selected items, so we begin by testing the state passed in the style option and filling the background if necessary. First, the largest possible radius of the circle is determined by taking the smallest dimension of the style option's rect attribute. Using the model index supplied, we obtain a value for the brightness of the relevant pixel in the image. The radius of the circle is calculated by scaling the brightness to fit within the item and subtracting it from the largest possible radius. We save the painter's state, turn on antialiasing (to obtain smoother curves), and turn off the pen. The foreground of the item (the circle representing a pixel) must be rendered using an appropriate brush. For unselected items, we will use a solid black brush; selected items are drawn using a predefined brush from the style option's palette. Finally, we paint the circle within the rectangle specified by the style option and we call restore() on the painter. The paint() function does not have to be particularly complicated; it is only necessary to ensure that the state of the painter when the function returns is the same as it was when it was called. This usually means that any transformations applied to the painter must be preceded by a call to QPainter::save() and followed by a call to QPainter::restore(). In this example, we use a main window to display a table of data, using the custom delegate to render each cell in a particular way. Much of the MainWindow class performs tasks that are not related to item views. Here, we only quote the parts that are relevant. You can look at the rest of the implementation by following the links to the code at the top of this document. This enables the items to be drawn without any gaps between them. Removing the headers also prevents the user from adjusting the sizes of individual rows and columns. We also set the minimum section size to 1 on the headers. If we didn't, the headers would default to a larger size, preventing us from displaying really small items (which can be specified using the Pixel size combobox). The custom delegate is constructed with the main window as its parent, so that it will be deleted correctly later, and we set it on the table view. Each item in the table view will be rendered by the PixelDelegate instance. We also connect the spin box to a slot in the MainWindow class. This forces the view to take into account the new size hints for each item; these are provided by the delegate in its sizeHint() function. We explicitly resize the columns and rows to match the Pixel size combobox.